What is a mind machine? A mind machine can be defined as an equipment that empowers you to change your brain waves for the desired alpha, theta, etc. states for the desired benefits/learning/goals. What research is the mind machine based on? How does it work? These are questions that most people ask when something new is presented that is different from what they have seen or heard about. Even though these mind machine inventions are new, but the fundamental that these mind machines are based on, are not new. Like many inventions, these mind machines were developed by experimenting, discovering and utilizing the very best of many different mind technologies. 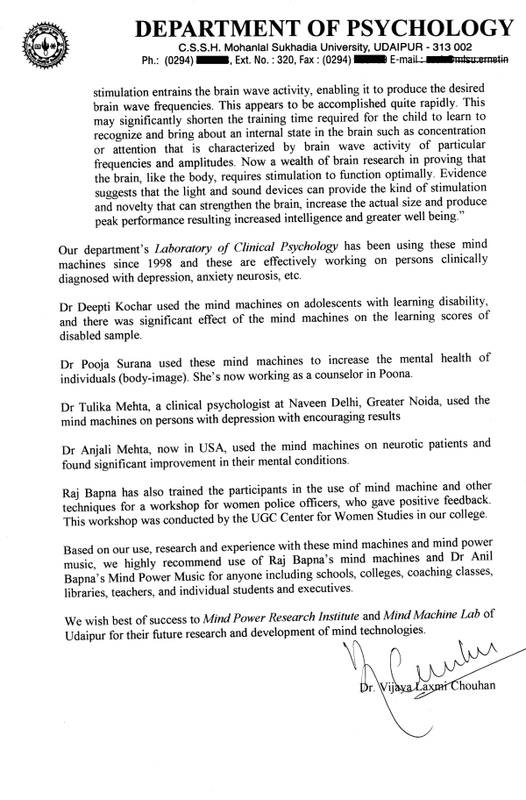 We developed India's first mind machine in 1993, and since then, we have learned a lot more and gained enormous experience in the use of mind machines and Dr Anil Bapna's Mind Power Music, for relaxation and learning, and now finally so many years after the first mind machine, the Super IQ7 is ready. Why did it take so many years? Because it required various scientific breakthroughs in mind technologies that took us years of research, and no doubt, my 3-year stay in USA between 2000 and 2003 as a founding member of a software company in California also helped. The new mind machine is far more powerful/useful in various ways than the original 1993 mind machine. The new mind machine is so powerful, you "feel the results" within 15 Minutes of use. One program is of 7 minutes only and it gives result in as little as 3 minutes. And equally important, we have been able to reduce prices to about one third of what it would cost in 1993. Please realize that the mind machine incorporates my lifetime of keen interest and deep learning in mind power, neuro-linguistic programming, beliefs and secrets of success. In USA, I attended one seminar by Richard Bandler, the genius who developed NLP, and another by Anthony Robbins in 1990, and I had already been learning success secrets long before that. Let me briefly explain the advanced mind technologies used in the mind machine. You'll read that mind machine changes brain waves, so let me first explain what are brain waves. When you drop a small stone in water, you see waves. Similarly our heart and our brain have wave patterns. The wave pattern of the heart is measured by ECG (electro cardiograph). 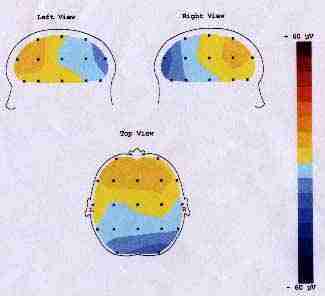 The brain waves are measured by EEG (electro encephalograph). Using the brain wave studies, scientists have discovered that our brain waves are of four types. The brain waves also have peaks that are similar to the peaks we see in water waves. The number of times the peak appears in one second is called "cycles per second". For example, the electricity in India is of 50 cycles per second. This brain wave indicates that your conscious mind is in control. It indicates a mental state of logical thought, analysis, and action. You are alert and awake talking, speaking, doing, solving problems, etc. This brain wave indicates relaxation and meditation. It is a state of relaxed alertness good for inspiration, learning facts fast. Deep meditation. This is associated with life-like imagination. This is best for suggestibility and inspiration. This brain wave is dominant in children of age 2 to 5. Here is brief overview of the mind technologies used in the mind machines. The simple truth is that there is no other comparable mind machine system in the whole world because it is radically different and enormously powerful. It means that there are messages which are hidden from your conscious mind, which cannot be heard, it does not interfere with these messages. But, your sub-conscious mind can hear these messages and accept them for the desired changes. Recently I conducted a workshop for experts and owners of colleges at the Hotel Hyatt Regency in Mumbai, where the fee to attend was Rs 19,000 per person to hear me for 2 days, and one of the participants was Prof Ashok Davda of Thane. 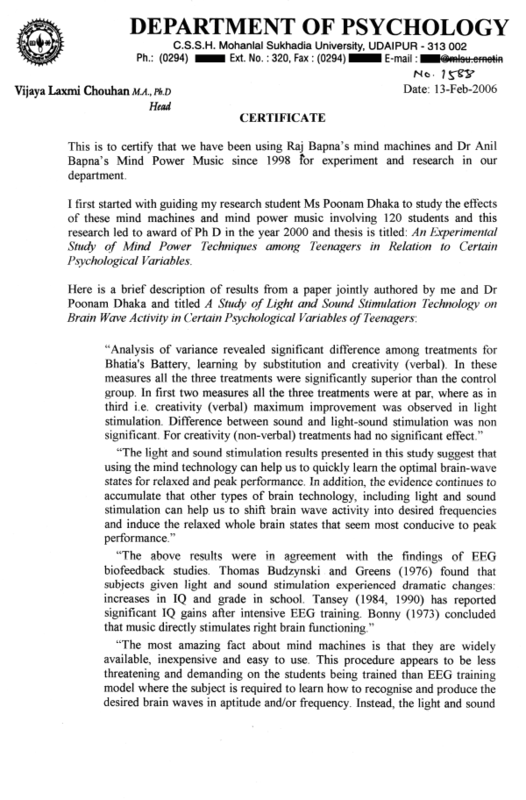 Initially, Prof Davda, like many others who first hear of subliminal messages, was skeptical of our Mind Power Music technology and did not believe that such a thing could work. But being a professional hypnotist, he decided to check us out. He simply ordered some of our Dr Anil Bapna's Mind Power Music [programs], and then what he did is really creative and remarkable. He hypnotized one of his students and played our program. In the program, what we all hear is sounds of birds, sounds of water/river and very relaxing special music, but no words. But what Prof Davda did was to ask his hypnotized student, "What words do you hear?" And to Prof Davda's utter amazement, the student heard positive empowering messages and spoke out what he heard. Being scientific by nature, what Prof Davda did next is also surprising. He noted down the words (messages) heard by the hypnotized student, and then traveled to Udaipur from Thane. And then he asked us, "What are the exact messages on this program?" We showed him the list messages. And to Prof Davda's total surprise, our list of messages matched with the student's list. And, that is how Prof Davda became our great friend. "I first heard it in a float tank, where, having donned stereo headphones, I heard calm voices against a background of stately, soaring synthesizer music, gently guiding me into a deeply relaxed state. Then the soundtrack divided and I heard a separate voice in each ear, each voice narrating a completely different fairy-tale--charming stories of wizards, magic cities, intergalactic zoos, and mystic shoemakers. "This simultaneous input overloads the conscious mind," says Glauberman, "because there is simply too much information to process consciously." Unable to focus on either story, I found, your conscious mind tends to let go or turn off. When the half-hour session was over I seemed to awaken (though I knew I hadn't been asleep), feeling like I had had a delightful experience, though I couldn't quite remember just what the experience had been." You hear a different story in each ear in my voice that makes artful use of language, neuro linguistic programming, Ericksonian techniques to immediately produce measurable relaxation in you while building positive, powerful, empowering beliefs that produce dramatic breakthrough results for you. I load the tales with variety of powerful suggestions that are best for students, in such artful way that the suggestions remain in indirect terms and seemingly are simply part of the story, so they go unnoticed. And, because the conscious mind can at best focus on one story at a time, it usually gives up and stops paying conscious attention, and as a result, most of the stories and the empowering messages hidden within them bypass the conscious mind completely, entering the unconscious mind. This is the most powerful method of belief change because it really works and it is effortless on the part of the listener. The real test of a DAPS program is not listening to analyze it, but to close your eyes, sit comfortably or lie down, and listen to it and feel the results for yourself: Does it make you more relaxed than you have ever been in your life before? Does it make you feel like you feel just before you fall asleep? Does it make you feel relaxed? When I ask users these questions, just after they use the mind machine for the first time, they say, "Yes". "... these high-tech mechanisms can be of tremendous use in the right hands. They can help create the kinds of waves in your mind so that you start feeling relaxed, as if half asleep ... thoughts are disappearing and a moment comes that everything becomes silent in you. That is the moment when the waves are those of deep sleep. You will not be aware of this deep sleep, but after 10 minutes, when you are unplugged from the machine, you will see the effects: you are calm, quiet, peaceful, no worry, no tension; life seems to be more playful and joyous. One feels as if one has had an inner bath. Your whole being is calm and cool. With machines, things are very certain, because they don't depend on any doing of yours. ... but these machines can certainly create within 10 minutes a possibility that you may not be able to create in years of effort." What is brainwave? When you drop a small stone in water, you see waves. Similarly, the brain has waves that are measured as frequency in cycles per second and recorded by EEG. If you play sound of 500 Hz in one ear and 510 Hz in the other ear, your brain "hears" the sound of frequency that is the difference of the two frequencies, i.e., 510-500 = 10 Hz. This sound is called binaural beat and it does not actually exist in the environment around us, but it is only in the mind. Students who study Physics know it is similar to "resonance". When this happens, researchers are able to measure increased levels of bilateral synchronized brain wave activity at the frequency of the binaural beat. 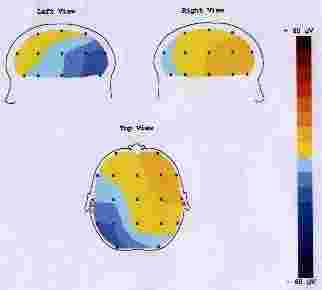 A scientist in USA named Robert Monroe found in 1960's that part of the brain, called the olivary nucleus, begins to resonate with the binaural beat. This phenomena is called brainwave entrainment. The olivary nucleus sends signals upward into the cerebral cortex that mix with the existing brain wave patterns to produce noticeable changes. Monroe finally found that with certain frequencies, he could produce a unique and coherent brain state called hemispheric synchronization. These binaural beats are used to help/teach people to achieve alpha or theta states of calm attention in which it is easier to learn, meditate or relax. Brainwave Sync Tonal Matrix, the mind technology developed by us and used in our mind machine, uses binaural beats technology, but it is far more complex and advanced than just using 500Hz and 510 Hz for the two ears. 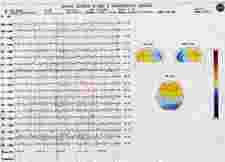 It is based on years of experiment, research and development to discover what combinations work best for focus/ concentration, for memory/learning, for relaxation, etc. We have used all four types of brainwaves Alpha, Beta, Theta, and Delta in the best possible way for use during learning, before learning, after learning or to awake and energize. There's a world-wide explosion of advanced techniques for accelerated learning, supercharged remembering, and peak mental performance. The publication of the book Superlearning by Sheila Ostrander and Lynn Schroeder made superlearning or accelerated learning techniques popular. These help you use your whole brain (both left brain and right brain) for learning and memory. The Vocab-Builder Mind Machine (CAT, GMAT, GRE, etc.) uses advanced accelerated learning techniques along with other mind technologies to enable users to effortlessly memorize words 3 to 7 times faster. For example, the Washington State Department of Health and Social Services reported that by using Superlearning techniques, Indochinese refugees learned English five times faster. At Iowa State University students learned Spanish seven times faster. And from Australia's Woden TAFE College, John Wade revealed, "I have used the Superlearning technology with adult migrants learning English. The results from controlled experiment ... show that long term memory retention increased sixfold." Neuro Linguistic Programming uses languages in specific ways to make desired changes in the mind. The program program to "Enter the Learning State" uses many techniques from NLP and are so powerful that in just 15 minutes you can FEEL the effects on your body/mind. The effects are very difficult for me to explain fully to you but very easy to feel and experience for yourself. I would like to give an analogy: it is like trying to explain what light is to a blind person; it would be impossible to explain the colourful world in words to someone who has never seen "light", but as soon as a medical discovery can cure the person's eye and bring vision, the person can immediately see the beautiful world in all vibrant colours. If what we hear and see are uniform, non-changing and constant, after a little time, the mind realizes that these signals are constant and offer no danger or other valuable information, and the mind stops paying attention to them, leading to mind becoming free to take the attention inwards, and this results in deep relaxation. Some of the programs make use of the Ganzfield phenomenon. Dr Tomatis, a French ENT surgeon discovered that certain high frequency sounds have greatly beneficial effects, which the writer Patricia Joudry describes as below: "a listening technique using high frequency music for beneficially recharging the cortex of the brain. The effect upon the person is one of vitalizing, harmonizing and healing in almost every area of being". Below is the complete letter. If you read this 2 page letter, you'll note that students improved score in learning and creativity. 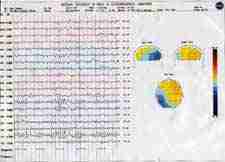 Here are some computer images from an EEG study conducted by Dr Vinita Goyal, MBBS, MD, on 23-Dec-2003 in Udaipur at Goyal Hospital with the RMS EEG computerized equipment using the mind machine on Raj Bapna himself. For clarity part of the view from part of the EEG readings shown above. For clarity part of the view from EEG reading shown above. My goal here is to show you some of our R&D effort and that we work very hard in our research and development effort, which is the real secret behind the best-selling success of our mind machines even though we refuse to hire professional advertising agencies to develop flashy, multi-color ads, and prefer to write detailed articles to educate our customers.